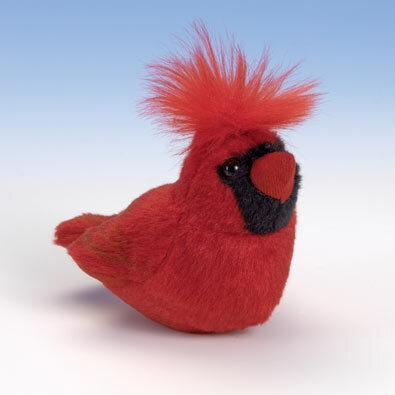 This Cardinal bird is educational as it plays its own unique and realistic bird song, provided by the Cornell Lab of Ornithology. Cardinal measures 6-1/2" x 4-1/2" x 5". Ages 3 and up. This Chickadee bird is educational as it plays its own unique and realistic bird song, provided by the Cornell Lab of Ornithology. Chickadee measues 7" x 5" x 3-1/2". Ages 3 and up. This Robin bird is educational as it plays its own unique and realistic bird song, provided by the Cornell Lab of Ornithology. Robin measures 8" x 5" x4". Ages 3 and up. This Goldfinch bird is educational as it plays its own unique and realistic bird song, provided by the Cornell Lab of Ornithology. Goldfinch measures 7" x 4-1/2" x 3-1/2". Ages 3 and up.